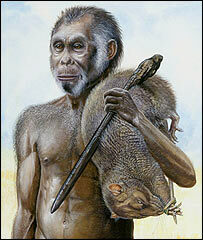 The three-foot (one-metre) tall species - dubbed "the Hobbit" - lived on Flores island until at least 12,000 years ago. The fact that little people feature in the legends of modern Flores islanders suggests we might have to take tales of Leprechauns and Yeti more seriously. Details of the sensational find are described in the journal Nature. Australian archaeologists unearthed the bones while digging at a site called Liang Bua, one of numerous limestone caves on Flores. The remains of the partial skeleton were found at a depth of 5.9m. At first, the researchers thought it was the body of a child. But further investigation revealed otherwise. Wear on the teeth and growth lines on the skull confirm it was an adult, features of the pelvis identify it as female and a leg bone confirms that it walked upright like we do. "When we got the dates back from the skeleton and we found out how young it was, one anthropologist working with us said it must be wrong because it had so many archaic [primitive] traits," said co-discoverer Mike Morwood, associate professor of archaeology at the University of New England, Australia. The 18,000-year-old specimen, known as Liang Bua 1 or LB1, has been assigned to a new species called Homo floresiensis. It had long arms and a skull the size of a large grapefruit. LB1 shared its island with a golden retriever-sized rat, giant tortoises and huge lizards - including Komodo dragons - and a pony-sized dwarf elephant called Stegodon which the "hobbits" probably hunted. Chris Stringer, head of human origins at London's Natural History Museum said the long arms were an intriguing feature and might even suggest H. floresiensis spent much of its time in the trees. "We don't know this. But if there were Komodo dragons about you might want to be up in the trees with your babies where it's safe. It's something for future research, but the fact they had long arms is at least suggestive," Professor Stringer told BBC News Online. Studies of its hands and feet, which have not yet been described, may shed light on this question, he added. H. floresiensis probably evolved from another species called Homo erectus, whose remains have been discovered on the Indonesian island of Java. Homo erectus may have arrived on Flores about one million years ago, evolving its tiny physique in the isolation provided by the island. What is surprising about this is that this species must have made it to Flores by boat. Yet building craft for travel on open water is traditionally thought to have been beyond the intellectual abilities of Homo erectus. Even more intriguing is the fact that Flores' inhabitants have incredibly detailed legends about the existence of little people on the island they call Ebu Gogo. "There have always been myths about small people - Ireland has its Leprechauns and Australia has the Yowies. I suppose there's some feeling that this is an oral history going back to the survival of these small people into recent times," said co-discoverer Peter Brown, an associate professor of archaeology at New England. 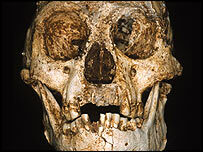 Yet there are hints H. floresiensis could have lived on much later than this. The last legend featuring the mythical creatures dates to just 100 years ago. 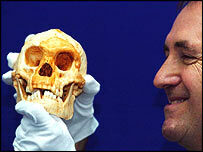 Professor Stringer said the find "rewrites our knowledge of human evolution." He added: "To have [this species] present 12,000 years ago is frankly astonishing." Homo floresiensis might have evolved its small size in response to the scarcity of resources on the island. "When creatures get marooned on islands they evolve in new and unpredictable courses. Some species grow very big and some species grow very small," Dr Gee explained. The sophistication of stone tools found with the "hobbit" has surprised some scientists given the human's small brain size of 380cc (around the same size as a chimpanzee). "The whole idea that you need a particular brain size to do anything intelligent is completely blown away by this find," Dr Gee commented. Because the remains are relatively recent and not fossilised, scientists are even hopeful they might yield DNA, which could provide an entirely new perspective on the evolution of the human lineage. Not much chance of this however now in 2008 Humanity evolved elsewhere and not on this planet. When we observe the human genome we find aspects of it that are not parallel with normal evolution on this planet no links have been found only sparse connections at best. Many leading geneticists today think along the lines that humanities origins are from off world. So if this is the case where did we come from?